I think there is something magical about the souls that the barn builds. 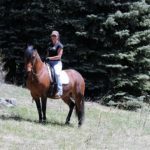 While there is magic made in the saddle, and horses have dramatically altered each of us for the better over time, I like to think that just being in the barn is enough to have a positive impact on anyone. The barn teaches all the major lessons of life within its four walls and pasture fences. It doesn’t take into account age, gender, race, education or family history. It teaches with the severity and grace of life itself. I remember learning about hard work. Two hundred bales of hay don’t unload themselves, and the incoming rain doesn’t care that your back hurts, you haven’t eaten in 10 hours, and your hands are bleeding from blisters. If you don’t finish, you lose the hay, and you can’t afford more. That’s hard work. I remember learning not only a respect for what real manual labor is, but also a compassion for those who perform it. The workers in the bigger barns aren’t nameless faces; they are men and women with hopes, dreams, opportunities and dead ends like the rest of us. Their backs hurt by the 50th bale, too, but they keep going. Even though I no longer do the hard labor of big barns, I will never lose the respect and compassion for those that do, and never miss an opportunity to thank them and offer a helping hand. I remember learning the value of a dollar. My dad gave me $500 for my first horse as a Christmas/birthday present when I was 9. 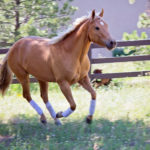 I bought a 9-year-old unbroken Arabian gelding, still in a field with his mother. And that was it—we didn’t have anything left over for a saddle, so I rode without one for almost a year or borrowed them graciously from friends. I fell off 78 times in the first year. Yes, I still have my diary, and I counted. I worked off board and lessons, and saved and begged to go to an event. When I got there, I jumped out of the dressage arena and eliminated myself—my hopes and dreams and mouths full of dirt culminating in disappointed parents and a lot of money lost. My dad then told me to get a job, so I did. I designed websites for money for shows during middle school, and went halfway across the country during the summer of high school to find a working student job with a stipend. While my income as an adult is vastly different, I don’t forget the feeling of never buying anything and feeling complete, because just having the horse was enough. Just having the horse was everything. The barn taught me perspective. When it doesn’t rain, and the pastures don’t hold up, and you can’t afford more hay, it’ll be OK. The rain will come next year, and somehow this year you will make it. It might mean a lot of hard decisions and sacrifices, but that’s life. The barn makes for a different childhood experience. When all the other teenagers are out partying on a Saturday night, you will be lying in the bed of a truck staring at the sky. You’ll get to see stars how they are meant to be seen—by the thousands—not just the few that shine through the light pollution of the cities. You will learn peace with the silence of the outdoors, and a kind of meditation that comes from hours of manual labor with nothing but wind and animals’ breath as music. I remember learning that life isn’t fair. I paid attention to every hair on my first horse, but I remember sitting and crying in a wash rack as my horse colicked. I stared in horror as the oil and charcoal we pumped into him spilled onto the ground, and I grappled with the fairness of life and death. When, 10 years later, I sat next to my father as he was on life support, and I decided it was best to let go and take him off the machines, I didn’t need to struggle with the existential questions of fairness. The barn had already taught me: Life isn’t fair, and neither is death. The barn has taught me about unconditional love. The barn doesn’t care what you drove to get there, or what you are going home to. It is a haven for those who give it their all, and it will take everything you have to give. It will take your immaturity and give you discipline. It will take your excuses and give you failure. It will take your dreams and give you opportunity. But it makes no promises, picks no favorites, and spares no hardships. The barn taught me passion. Very few people get to experience passion at its core, in the way that it is meant to be felt. Not the passion of winning—that is superficial and relative. But rather the passion that you feel when you have nothing left but your love of something. The passion that is there when exhaustion steals your strength and frustration takes your hope. When all you are left with is this very moment, and yet you are at peace and fulfilled. That is passion in its truest form, and that is what fuels us in barns, and what sneaks into the souls of children and never lets go. That passion drives the thousands of adult amateurs to work 60-hour weeks and still ride, and the professionals to lose in grand fashion but show up the next day at 5 a.m.
It’s easy to get wrapped up in the side of life fueled by possessions and titles and bank account balances. It’s easy to focus on what you don’t have and who you aren’t. But the barn will teach you better. You have what you have, and it has to be enough, so make do. The barn will build your soul, and it will give you all the gifts you need to be a good, gracious person. It is up to us to keep these things when we pass through the gate. If you related to any part of this blog, you are lucky. Many go through life never really feeling passion; they only have material possessions to try to satisfy their souls. But to the souls the barn built, life is about sitting in a warm rain on a summer day and laughing with your friends. It is about lying on the back of your horse at midnight, in a field, and staring at the stars. I love this piece and wanted to share it. Kristin Carpenter owns Linder Educational Coaching in Arlignton, Virginia that works mainly with teenage boys with behavioral issues. She grew up in rural Baton Rouge, Louisiana. There is so much truth here and the effect that hard work and animals have on the soul is immeasurable. 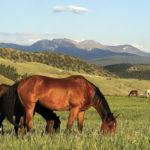 Colorado Horsecare Foodbank FUNdraiser Coming September 28th!